In an attempt to keep Infraline Energys’ readers abreast with the key issues and challenges engulfing the sector, Infraline Energy tries to bring forth the opinion of key personnel whose decisions and opinion play a vital role in shaping the sector. Coal is a sedimentary rock of organic composition consisting of carbon, hydrogen, oxygen and minor proportions of nitrogen and sulphur plus some other trace elements. The coal is a heterogeneous substance. Coal is the result of accumulation of vegetable debris in a specialized environment of deposition. The accumulation could occur in-situ due to submergence of vegetable matter under water and being subsequently subjected to prolonged sedimentation. The other theory is based on drifting of vegetable mass due to flowing water and its accumulation in a huge basin layer by layer and being subsequently subjected to sedimentation. The variety of coals found in different coalfields are a result of very complex process of coalification which is site specific and is a result of varying degrees of deposition history with respect to burial time, temperature & pressures. In India, most of coal is formed as a result of transportation of vegetable mass to nearby basin. Hence, it is considered to be formed under the "Drift Theory"
Coal is formed when peat undergoes physical and chemical alteration. This process is called "coalification." During coalification, peat undergoes several changes as a result of bacterial decay, compaction, heat, and time. Peat deposits are quite varied and contain everything from pristine plant parts (roots, bark, spores, etc.) to decayed plants, decay products, and even charcoal if the peat caught fire during accumulation. Peat deposits typically form in a waterlogged environment where plant debris accumulated over the years. e.g. peat bogs and peat swamps. In such an environment, the accumulation of plant debris exceeds the rate of bacterial decay of the debris. The bacterial decay rate is reduced because the available oxygen in organic-rich water is completely used up by the decaying process and anaerobic (without oxygen) decay is much slower than aerobic decay. For the peat to become coal, it must be buried under layers of rocks formed by sedimentation process. Burial process compacts the peat and as a consequence of which much water is squeezed out during the first stages of burial. Continued burial and the addition of heat transforms the complex hydrocarbon compounds in the peat mass to further break down and alter in a variety of ways over a long time period. The gaseous alteration products (e.g. methane) are typically expelled from the deposit which becomes more and more carbon-rich as the other elements disperse. The various stages of this trend proceed from plant debris through peat, lignite, sub-bituminous coal, bituminous coal, anthracite coal, to graphite (a pure carbon mineral). Bituminous coal is formed under more heat and pressure, and is 100 million to 300 million years old. It is named after the sticky, tar-like substance called bitumen that is also found in petroleum. It contains about 45-86% carbon. Bituminous coal is divided into three major types: Smithing coal, Cannel coal, and Coking coal. Smithing coal has very low ash content, and is ideal for forges, where metals are heated and shaped. Coking coals are of mainly three types High Vol, Medium Vol and Low Vol which is basically measured by its volatile contents. Sometimes the bituminous coals are further subjected to high pressure & temperatures due to igneous intrusions like dykes & sills and acquire very good coking properties. In general terms, based on the rank, coal can be classified as either “thermal” coal or “metallurgical” coal. Thermal coals are mostly sub-bituminous & are lower in carbon content, higher in ash% and calorific value, higher in moisture value and are the world’s most abundant fossil fuel. These are primarily used to produce energy. Metallurgical coal or Coking coal is less abundant than thermal coal and is primarily used in the production of coke which is an important part of the integrated steel mill process. Some bituminous Coal when heated in an oven in the absence of air, form coherent beads, free from volatiles, with strong and porous mass, called coke. The special class of caking coals that yield a satisfactory coke are known as coking coals. It is unfortunate that the words caking and coking are so similar, because they are not synonymous. All coking coals are necessarily caking coals, but not all caking coals are coking coals. Coking coal has coking properties and it is mainly used in steel making and metallurgical industries. It also finds use in the manufacturing of hard coke. In order to be of use in the metallurgical industry, the coke needs to meet five criteria. To be a useful reducing agent, the coke must have a very high carbon content. To keep the iron reasonably pure, the coke must have low contents of sulfur and ash. To provide ample heat, the coke must have a high content of fixed carbon and have a high calorific value. Finally, to help keep the cost of the iron low, the coke must be cheap. Total moisture – It is limited to 10% maximum in as received condition. High moisture creates handling problem and lowers available carbon. Ash – It is limited to 10% maximum in air dried condition. High ash content reduces BF productivity and increases coke rate in the furnace. Volatile matter (VM) – The volatile matter in coking coals ranges from 20% to 35% in air dried sample. High volatile matter reduces the yield of metallurgical coke in coke oven battery but improves the coke oven gas generation. Sulphur – In coking coals sulphur is to be limited to 0.6% maximum in as dried condition. Higher sulphur in coking coals increases the sulphur content of hot metal in blast furnace. Phosphorus – Phosphorus content of coking coals is to be limited to 0.1% maximum in as dried condition. Phosphorus goes to hot metal in blast furnace creating difficulties in dephosphorisation during steel making. Crucible swelling number (CSN) – The range of CSN in coking coals is 3 minimum to 6 maximum. Prime coking coals have higher CSN values while soft coking coals have low CSN values. Maximum dilatation – The value of maximum dilatation is 55% minimum. It depends on the value of maximum dilatation of the coal blend components. Maximum fluidity – The value of maximum fluidity in coking coal is on an average is 600 ddpm Higher fluidity gives better flowability in the coke ovens. Alkalis (Na2O, K2O) – The alkalis in coking coals is to be controlled at 2% maximum in coal ash. High alkali content is not desirable in BF and also affects the BF lining adversely. Ash fusion temperature (AFT) – In coking coals higher AFT is needed and it should be 1450ºC minimum. AFT in coking coals is to be higher than coking temperature. Gray king coke type – The value of the Gray king is to be G 5 minimum in coking coals. For soft coking coal the limit of Gray king value is G min. Mean Maximum Reflectance (MMR) – The value of MMR in coking coals vary in the range of 0.85% – 1.35%. Soft coking coals have lower MMR while hard coking coals have higher MMR. Vitrinite – The value of vitrinite in coking coals is 50% minimum. For soft coking coals the limit is 45%. Vitrinite distribution (V9 – V14) – The value of vitrinite distribution in coking coals is 70% minimum. Hard coking coals are a necessary input in the production of strong coke. They are evaluated based on the strength, yield of and size distribution of coke produced which is dependent on rank and plastic properties of the coal. Hard coking coals trade at a premium to other coals due to their importance in producing strong coke and as they are of limited resources. They can be categorised into Prime Hard Coking Coal (with significant coking properties) and Semi Hard coking coal (coking properties lower than prime hard coking coal). Generally, blends of these two categories of coking coal are used to produce the desired quality of coke at optimum prices. In Japan and South Korea, the desired blend of coking coal for making a target coke is achieved by blending about 14 – 15 types of coking coal. Semi-soft coking coal (SSCC) or weak coking coal is used in the coke blend, but results in a low coke quality with a possible increase in impurities. There is scope for inter-changeability between thermal coal and SSCC and thus SSCC prices have a high correlation with thermal prices. But, thermal coal and SSCC have different usages whereas SSCC cannot be used in power plants as a substitute for thermal coal due to technical reasons. Coal used for pulverised coal injection (PCI) reduces the consumption of coke per ton of pig iron as it replaces coke as a source of heat and, at high injection rates, as a reductant. PCI coal tends to trade at a premium to thermal coal depending on its ability to replace coke in the blast furnace. It is a non-coking coal but can be used for blending in coke oven in order to reduce the coke strength or wall pressure of coke for the oven. India accounts for approx. 7% of the global coal resources and stands 6th in the World while it acquires 3rd ranks among the top coal producers worldwide. India possesses 6.8% of global proven reserves. BCCL (Bharat Coking Coal limited) , a subsidiary of Coal India Limited (CIL) has coking coal mines in the Jharia coalfield and is India’s biggest producer of coking coal. BCCL coal production was 35.86 MT (2015-16) out of which 32.65 MT was coking coal. Only St-I grade coking coal (0.037 MT) is used as direct feed in Steel Plants. Approx. 29.46 MT of coking coal (washery grade) is being fed to Power Plants which if suitably washed (ash reduction from 34% to 15%) at 20% yield could be used in Steel Plants. Upto 3rd Quarter of 2016-17, BCCL’s offtake of raw coal to power sector was 19.98 MT and only 0.70 MT to steel sector out of total offtake 25.36 MT. Tata Steel owns 5 coking coal mines in Jharia coalfields (3 at Jamadoba and 2 at Sijua ) in Jharkhand. SAIL and TATA have long term linkages from BCCL but are majorly dependent upon imported Metallurgical coal sourced from Australia, Russia, Canada, USA, etc. If we are able to use the high ash Washery Gr. III & IV coals for the indigenous Steel Industry after due washing then we can gainfully utilize the precious resource for the right industry. Globally, coking coal is traded either through quarterly or annual contracts signed between the steel companies and the miners/traders mutually negotiated based on benchmark spot prices or deals are struck based on daily spot price assessments between steel companies and miners/traders. Assessed values are based on confirmed spot transactions and normalization of values of hard coking coal with similar properties to the 3 grades. The daily assessed transactable values at which a cargo could be traded are published by agencies like Platts, IHS, GlobalCoal . The requirement of these metallurgical coals by various companies is dependent upon the type of Steel Mills (e.g. Recovery type coke oven would need mid Vol to High Vol coking coal and non-recovery type Steel Mill would prefer Low Vol coking coal), quantity of indigenous coal availability, its own captive mines, blend ratios, BF capacity, Coke Oven market beyond its own needs, etc. For trades being done on CFR basis, the CFR ( China , India) less the daily published freight rates as per capesize, Panamax or Handymax is used to compare to the FOB prices. Similarly the FOB prices can be netted forward by adding the freight rates to the FOB spot prices. Daily Spot Prices for Semi Soft Coking Coal , PCI and Metallugical Coke are assessed in a similar fashion. The seaborne coal rally which saw hard coking coal prices rise to 325$/ton was spurred by supply issues after Beijing’s decision to limit coal mines' operating days to 276 or fewer a year from 330 before as it seeks to restructure the industry. Force Majeure condition occurred in Australian coal mines and fear of cyclone hitting coasts of Queensland and wet weather added to the supply side woes. Chinese government stimulus plans which saw steel production pick up only added fuel to the fire, but much of the latest gains and volatility have been blamed on credit-fuelled speculation on futures markets in China, and may not reflect real demand. China's major coal companies signed long-term supply contracts below spot prices in a bid to stabilize soaring coal prices. China has increased its sourcing from Mongolia & Russia as these coking coals are available much below Global Index prices. The Atlantic coking coal market also saw more downward pricing pressure for US coking coals, as a quiet market and fulfilled demand for higher-quality coal limited the opportunities for spot sales A ramp up in Mozambique coal sold at discounts of 2-5% to premium coal indices helped reduce demand for other high CSR coals. Cyclone Debbie wreaked havoc at major mines and ports in Australia in March end, disrupting exports from Australia. Most of the major Australian coking coal producers have declared force majeure in the biggest coking coal producing mines. The supply constraints have led to resurgence in coking coal prices with PLV Hard Coking Coal trading at peak of FOB 305 $/ton. The coal exports from Australia might take at least two months to regularise. The Govt. of India has imposed anti-dumping duty of $25.20 on met coke from China and $16.29 on met coke from Australia. A levy of anti-dumping duty will have a cost-push effect on the steel sector. The imposition of any anti-dumping duty will result in an increase in the cost of finished steel by Rs.700 to Rs.1500 per tonne. The reason of this impact is mainly due to the fact that most of this Met Coke is imported from China due to low production of indigenous Met Coke. Met coke prices have nearly tripled since January this year since the time the case was initiated and is currently ruling around $323 per tonne ( FOB, China), with no signs of abating. The steel industry in India especially with large blast furnaces of more than 1,200 cubic meters necessarily requires met coke with low ash content and moisture content of less than 5 per cent. Additionally, such coke must have low phosphorous and low sulphur content. This is required to ensure that blast furnaces run efficiently. Imported met coke is needed as the domestic met coke producers are unable to supply the raw material in the specification required by the steel industry, especially with regard to ash content. In 2015-16, 201 MT of coal was imported by India out of which 43.5 MT was coking coal. More than 70% of the coking coal imports are from Australia, followed by Mozambique Canada and US. CIL’s arm BCCL & CCL have recently raised the coking coal prices by about 20 per cent . The increase in price is done by subsuming washery recovery charge (WRC) which was being charged separately in the case on non-linked washery grade coking coal. The price of steel grade and direct feed coal has been linked to price of washed coking coal, which has been fixed on import parity price. However, the washed coking coal from BCCL & CCL have high ash content to the tune of 17-19% which is much higher as compared to international standards which hovers around 9-10% ash only. Hence, the indigenous washed coking coal cannot be directly linked to the international coking coal indices rather there has to be discounted based on the increase in ash percentages, lower CSN values, etc. With global coking coal prices cooling down, the hike in coking coal prices by CIL subsidiaries are expected to further boost coking coal imports and is expected to have major negative impact on margins of Steel sector which is yet to recover from the unprecedented global coking coal price rise. In the current scenario, the final landed price of imported coking coal is comparable to the base price of Steel grade coal from BCCL which makes the latter an unviable option for the steel industry. Keeping the better coking properties of imported coking coal in mind, the price rise by CIL is all the more unreasonable. 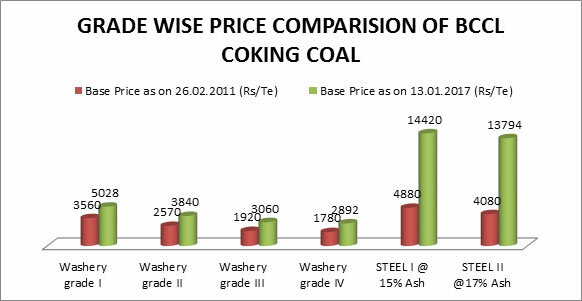 As depicted in the table above, there has been a staggering increase in the prices of BCCL coking coal. The prices of Steel Grade I and Steel Grade II coking coal has witnessed an increase of 195.5% and 238% respectively over the period 2011-2017, which is highly unreasonable and adds to the woes of the steel industry plagued by lack of demand. BCCL can mine the Underground deposits with the help of MDO and sell the coal to end users on cost plus basis. The coal blocks in Jharia coalfield maybe delineated and awarded to end user entities/private sector either through e-auction or PPP. End users to finance and assist in R&R activities in return of firm supply commitments. In either of these cases, there will be a gestation period of 4-5 years requiring land acquisition, R&R, seeking various statutory clearances, mine development, infrastructure development, etc. In all the cases, new washeries for individual or group of mines will have to be installed to wash high ash coking coal. There are few deposits of Semi-hard and Semi-soft coking coal in the command area of CCL and SECL also which could be developed further to augment production and processed to get desired yields of coking coal. All the economic predictors world-over indicate with confidence that India will attain a stable growth of 8-9% in 2017-18 and may touch a double digit growth rates beyond 2018. Most of this growth shall be realized through the implementation of large infrastructural projects which in turn result into higher steel demand in the country. India would therefore be a large importer of Met Coal and Coke to support higher steel outputs in the country. BHP Billiton Ltd., the world’s biggest exporter of coking coal, sees long-term demand growth for steel-making ingredients supported by rising output in emerging economies led by India. Rising steel production capacity in emerging economies will support coking coal prices over the medium term, with India’s imports forecast to rise 8 percent a year through 2021. With framing of policies in the right direction, India can save its precious foreign exchange by way of gradually developing its own coking coal resources and reducing Met coal & coke imports. The Indian Steel Industry should be encouraged with a launch of lucrative policies to invite them to allocate the coking coal blocks for development & production of better grades of coking coals. To accomplish this, there would be a strong need to plan investor-friendly rehabilitation & resettlement policies coupled with maintenance of stable law & order situation in such coal bearing States like Jharkhand & West Bengal. In the recent coal block auction declaration for Steel Sector, some of the blocks are under heavily built-up areas, structurally disturbed & may yield lower mineable reserves. Alternatively, BCCL may infuse necessary capital to augment mining capacities of select grades of coking coal in some potential projects. Also, Sale of Steel Gr I & II coals could be planned at desired selling price to attain 14% IRR at 85% capacity utilization of BCCL mines on long term off-take contract basis so that such mines do not incur losses. Washery Grade III & IV coals should be made available to Steel Industry on linkage basis instead of supplying the same to power industry. These coals can be washed at idling washeries of Steel Plants and could be blended with imported coal before being coked for use in Blast Furnaces. While auctioning these coals under linkage auction policy, reserve price should be decided in such a way that buyers are attracted toward indigenous coal as these coals are high in ash content (25-35%) and would yield lower fractions (27-32%) of coking coal in the Washeries. However, the views expressed here are solely those of the author in his private capacity and do not in any way represent the views of the InfralineEnergy (Technologies India Pvt. Ltd.). The organization is not liable for any use that may be made of the information contained therein and any direct/indirect consequences resulting therefrom.